Genius is nothing else than a great aptitude for patience. 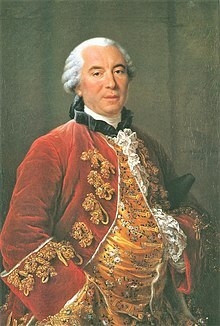 Georges-Louis Leclerc, Comte de Buffon (7 September 1707 – 16 April 1788) was a French naturalist, mathematician, cosmologist, and encyclopedic author. Man alone consumes more flesh than all the other animals together devour; he is, then, the greatest destroyer; and this more from custom than necessity. Instead of using with moderation the blessings which are offered him, instead of disposing of them with equity, instead of increasing them in proportion as he destroys, the rich man places all his glory in consuming, in one day, at his table, as much as would be necessary to support many families: he equally abuses both animals and his fellow-creatures, some of whom remain starving and languishing in misery, and labour only to satisfy his immoderate appetite, and more insatiable vanity, and who, by destroying others through wantonness, destroys himself by excess. Nevertheless, man, like some other animals, might live on vegetables. Histoire Naturelle (1753), trans. J. S. Barr, London: H. D. Symonds, 1797, vol. V, pp. 209-210. La génie n'est utre chose qu'une grande aptitude à la patience. Narrated by Herault de Séchelles (La visite à Buffon, ou Voyage à Montbard, 1790), when speaking of a talk with Buffon in 1785. (Not in Buffon's works.) Reported in Bartlett's Familiar Quotations, 10th ed. (1919). [F]rom the earliest periods of time [man] alone has divided the empire of the world between him and Nature. ...[H]e rather enjoys than possesses, and it is by constant and perpetual activity and vigilance that he preserves his advantage, for if those are neglected every thing languishes, changes, and returns to the absolute dominion of Nature. She resumes her power, destroys the operations of man; envelopes with moss and dust his most pompous monuments, and in the progress of time entirely effaces them, leaving man to regret having lost by his negligence what his ancestors had acquired by their industry. Those periods in which man loses his empire, those ages in which every thing valuable perishes, commence with war and are completed by famine and depopulation. Although the strength of man depends solely upon the union of numbers, and his happiness is derived from peace, he is, nevertheless, so regardless of his own comforts as to take up arms and to fight, which are never-failing sources of ruin and misery. Incited by insatiable avarice, or blind ambition, which is still more insatiable, he becomes callous to the feelings of humanity; regardless of his own welfare, his whole thoughts turn upon the destruction of his own species, which he soon accomplishes. The days of blood and carnage over, and the intoxicating fumes of glory dispelled, he beholds, with a melancholy eye, the earth desolated, the arts buried, nations dispersed, an enfeebled people, the ruins of his own happiness, and the loss of his real power. Buffon's Natural History (1797) Vol. 10, pp. 340-341, an English translation of Histoire Naturelle (1749-1804). Buffon produced in the fifty years from 1749 an Histoire Naturelle... one of the signal products of eighteenth-century science. ...He attempted to see nature as a whole, produced a vast synthesis and sought to give a picture of the history of the earth... [If] Newton had appeared to reduce the inanimate world to a system of law, Buffon... set his mind on a similar achievement, and even a wider one—comprising... biological phenomana and expanding into the realm of history. ...Along with Leibnitz he believed that the earth had once been in an incandescent state... part of the sun, but had broken away after a collision with a comet. He rejected the tradition that this globe was only six thousand years old and made an attempt to set out the periods or stages of its history; a time when mountain ranges were formed...a time when waters entirely covered... the globe... and a time when the continents came to be separated from one another. ...He held something like Leibnitz's idea that every plant and animal was composed of a mass of minute particles, each of which was a pattern of the whole individual; and this enabled him to explain the origin of living creatures without reference to an act of creation. He tried to show that no absolutely definite boundary existed between the animal and vegetable kingdoms. Nature always proceeds by nuances, he said. Buffon, the director of the Jardin du Roi... watched... the sun... Besides him.. stood... his latest experiment: four large wooden frames holding between them an array of over 150 mirrors. Screw threads ensured that each mirror was precisely aligned... Buffon had been inspired to conduct the experiment by the famous story of how... Archimedes defended his hometown from an attack by the Roman fleet... [by] focus[ing] the sun's rays onto the ships' wooden hulls. ...In 1747, at the age of thirty-nine, [Buffon] felt it was time to make his mark... Within two minutes the deal plank began to char, then to smoke. Just as it looked as if it would burst into flames, however, the sun disappeared behind a cloud. ...That summer, crowds flocked... to see the now celebrated scientist set fire to buildings over two hundred feet away. What better way to establish his name than to tackle the most fundamental philosophical question man could ask: When was the world created? And how? ...Unlike all previous theorists, Buffon chose to ignore the Bible. ...Instead, his inspiration came from Newton. ...he believed that Newton's mechanics would enable man to unravel the mysteries of the universe. If Newton's laws could explain the motion of the moon and planets... why shouldn't they also reveal our history? This page was last edited on 15 March 2018, at 21:09.